LEXINGTON, Ky. – (Sept. 11, 2018) – A food bank is delivering food faster and more efficiently with a Western Star 5700XE. The truck belongs to God’s Pantry Food Bank, which serves more than 400 food pantries and meal programs across 50 counties and 16,000 square miles in Central and Eastern Kentucky. The Food Bank distributes enough food to create more than 28.7 million meals annually and it depends on a small fleet of trucks to make sure the food gets to the locations on time. 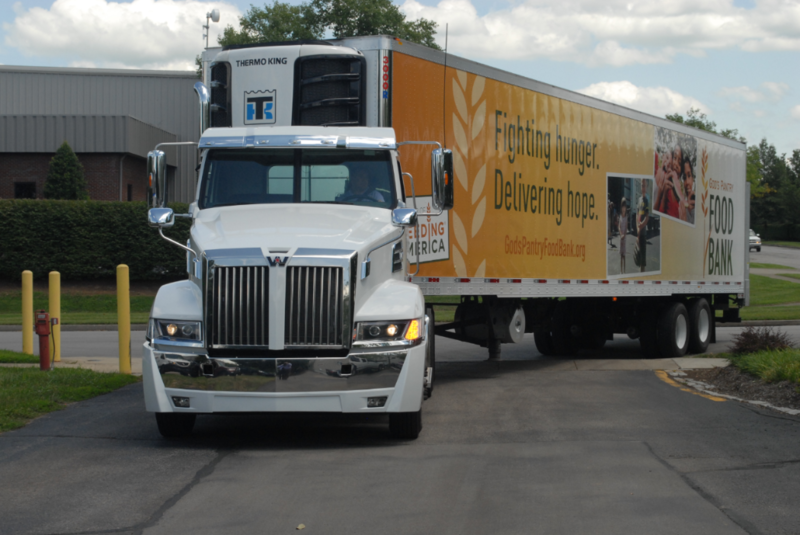 Earlier this year, The Food Bank received a grant to buy a new and much-needed truck. “We’re not truck people. We wanted to make sure we got the right one, a truck that we could count on for years of steady service,” said Mike Halligan, CEO of God’s Pantry Food Bank. So, The Food Bank turned to its board president, Grant Gabbard, for help. As executive vice president of The Allen Co., a road construction and asphalt paving company in Lexington, Gabbard knows trucks. Gabbard contacted Whayne Supply Co., a truck and heavy equipment dealer with 16 locations in Kentucky and Southern Indiana and a longtime supplier for Allen. “We were happy to work as the liaison between the dealer and The Food Bank to make sure it got the best truck possible. We’ve got a great relationship with Whayne and we knew they would go the extra mile to help the charity,” Gabbard said. The 2017 5700XE, which is spec’d with a Detroit™ DD13® engine and Eaton Fuller Advantage manual 10-speed transmission, hauls a 48-foot refrigerated trailer. God’s Pantry Food Bank needed a truck with enough power to handle the hills of Kentucky while still saving fuel, a priority for the non-profit. The fuel-efficient DD13 fit the bill while the 5700XE’s aerodynamic features also contribute to the savings. Other features include Detroit front and rear axles and a 126-inch day cab spec’d with a gray-and-red vinyl premium interior. The 5700XE cab is one of the roomiest in the business and maximized for driver comfort with an ergonomic design and advanced soundproofing. The 5700XE also saves The Food Bank time and money because it can carry in one trip what used to require two smaller trucks, said Halligan. DTNA’s nationwide network of service locations, including Whayne Supply, and industry-leading parts availability, means maximum uptime for a truck doing a crucial job.